This is not a city for the people. There are sacrifices to be made for those willing to become residents of the flagship of nature. Many things can be forgotten when you’re in the corner of the prestige/ “virgin nature”/ a wonder of the world but …not Christmas. The history of Galapagos is fraught with dramatic, sensational and colourful characters. in 1535 the Bishop of Panama, Fray Tomas de Berlanga, accidentally passed the Galapagos to do some fast and furious baptism en-route to Peru and was so relieved to get away that he called the place “hell on earth”. In 1835 the young Charles Darwin sailed through the islands on the Beagle, inspiring “The origin of Species” 24 years later. In 1929, German nudist doctor Friedrich Ritter eloped to the Galapagos with his former patient and lover bringing tantalising travel reports that inspired others to joined them, eventually gathering a sadly ironic collection of self-made refugees that all wanted to be as far from other humans as possible. This all ended in mysterious deaths and murder plots that became known as The Galapagos Affair. It seems that Galapagos is unsuccessful at retaining any human residents, adding more to its appeal as the perfect escape. Fleeing from a millenial syndrome of being overwhelmed by the norm of over-connectedness, I too joined in the crusade of the mass Christmas migrations. In prep for my getaway from a the United land of jingles, I prepared and fastidiously studied on every online entry of any Galapagos visit. Someone could do a Phd on the Galapagous online community it’s oddly interesting. There are arrays of impressive/expert-level of documentation on the animals and fauna and where, who and when to find ‘nature’. All of the photographs I came across miraculously avoided the more than 26,000 human residents inhabiting the islands. Where are the people? It’s almost as if humans are cropped out of the images, leaving behind only iguanas, giant tortoises, cruise ships, camera equipment and diving gear. It occurred to me that in this digitally dependent world, man-kind are seen as a sort of pollution that would be left out of the future collective imagination in this island that inspired evolution. Let me assure you that life is as normal here with a photo of last-minute turkey-shopping. Everything here is ‘Galapagos themed’. Even Langnese/Walls, the ice-cream here is marketed as “Pingüino”. Ironically unlike the red scorched humans, the Galapagos penguin (Spheniscus mendiculus) managed to adapt to the hot climate. While scientists busily search for invasive species, conservationists frantically teach how to spot the endangered and tourists rushing to upgrade the latest camera equipment… for the Galapagians, this is the week of seasonal festivities. I arrive into Baltra dodging the swinging sacks of loyal Santas, journeying treacherous long flights just to bring back the latest entertainment gadget from the mainland. To the sons and daughters this’ll be seriously brag-worthy stuff that money can’t buy. The shops here on the islands stock an eccentric array of everything that the factory district in Shenzhen didn’t manage to sell to America, at brow-raising prices. Yet the demand for limited goods are so high that I am witnessing T-shirts being stripped off of mannequins. Like the Chinese, the Galapagians also present rouge as a lucky colour for the new year. For an island where tourists are sporting eco/sports/camping ‘hiking sandles’, there are a large number of fashion shoe shops in Galapagos. You can spot a local straight away. Like Choy the shoe-shiner’s kid in the film mimic – you have to look at the shoes. As a rule of thumb, locals present footwear of a more -cosmopolitan nature. The human population of Galagos has increased by 4% annually. To the Golapagians, the islands are more of a commercial capital than a secluded nature reserve. 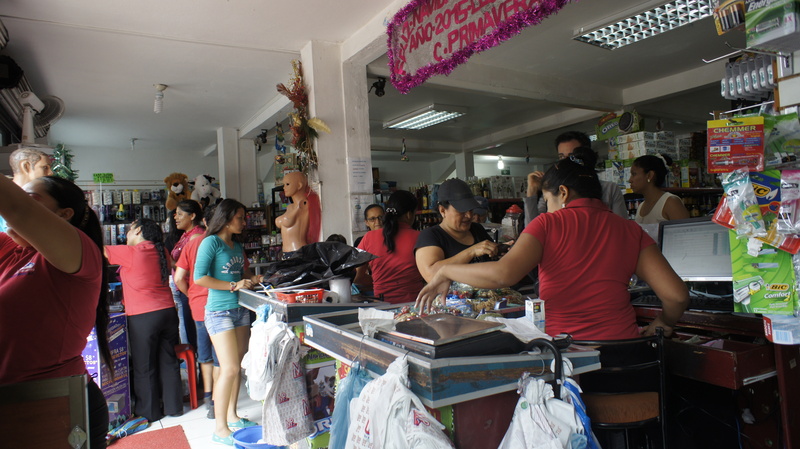 Compared with the general unemployment of 40% in the rest of the country in Ecuador, coming to the Galapagos Islands – where the salaries are at least 50% higher, must seem like Christmas. Thank you, I’ve just gotten started. Happy Holidays!